Senate Republicans voted on Friday against a "skinny" repeal of Obamacare in a 49-51 vote. Voting against the measure were Sens. Susan Collins (R., Maine), John McCain (R., Ariz.), and Lisa Murkowski (R., Alaska). The Senate voted on H.R. 1628, the Better Care Reconciliation Act of 2017, which would repeal the Affordable Care Act's individual mandate, employer mandate, and would eliminate the Medical Device Tax. The Congressional Budget Office scored the measure and found it will reduce the deficit from 2017 to 2026 by $142 billion. Earlier today, Sen. Lamar Alexander (R., Tenn.) said this repeal would help the Senate get to a place where it can craft a replacement to Obamacare with the House of Representatives. "We will have an opportunity to vote for a bill which will take us to the place called a conference committee with the House of Representatives where we can get a solution to our goal of repealing and replacing Obamacare now," he said. "It's being called a skinny bill because it won't have much in it. It is not a solution to the Affordable Care Act problems, but it is a solution to how we can get to a place where we can write the solution." Yesterday, the Senate failed to pass a measure that would repeal Obamacare without a replacement in a 45-55 vote. Touted by Sen. Rand Paul (R., Ky.), the measure aimed to be a clean repeal of Obamacare that would repeal the mandates, taxes, and spending. On Tuesday, the Senate voted 51-50 to move the debate on health care forward with Vice President Mike Pence casting the tie-breaking vote. 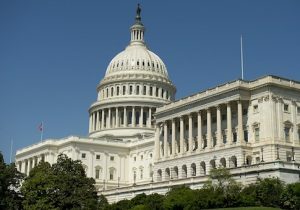 The Senate plans to vote on a series of measures this week in an attempt to reform health care. Following that vote, the Senate voted against a proposal to repeal and replace Obamacare in a 43 to 57 vote. The replacement plan voted on was the Senate's Better Care Reconciliation Act, which drew criticism from some conservative Republican senators who said the bill did not go far enough to repeal Obamacare.